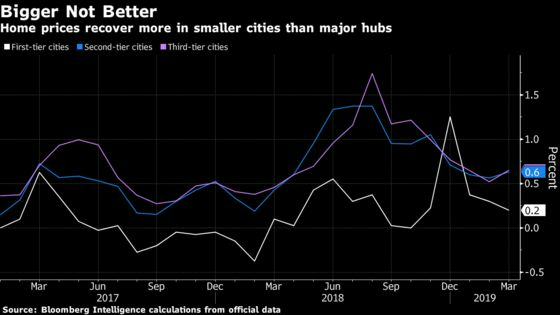 (Bloomberg) -- Property developers that focus on smaller cities in China are set to be the beneficiaries of a reform last week that could encourage 100 million rural citizens to move to urban areas. Policy makers said cities with an urban population of 1 million to 3 million should scrap the residency registration system this year, a move that is seen boosting housing demand in lower-tier cities. Developers with higher land reserves or housing inventories in those cities, especially growing areas such as the Yangtze River Delta and Greater Bay Area are among the winners from the policy, analysts say. “The speed of urbanization should accelerate, which is constructive for real estate developers, especially those focused on lower tier cities where we can expect stronger demand for residential properties,” said Ken Hu, chief investment officer for Asia Pacific fixed income at Invesco Hong Kong Ltd. Smaller cities have already seen bigger gains in home prices, according to March data released on Tuesday. The recovery was more evident in Tier 2 and Tier 3 cities, where local governments have increasingly loosened home buying restrictions. A rebounding real estate sector could help stabilise China’s economy which has been mired in a trade dispute with the U.S. in the past few quarters. The residency permit reform will likely add fuel to the rally in Chinese developers’ dollar bonds, which have returned 8.7 percent so far this year, one of the best performing sectors among Asian dollar-based notes. An index of shares in 22 Chinese developers also handily outperformed the broader Hang Seng index. Cities with a population of 3 to 5 million should substantially ease residency requirements, authorities said. 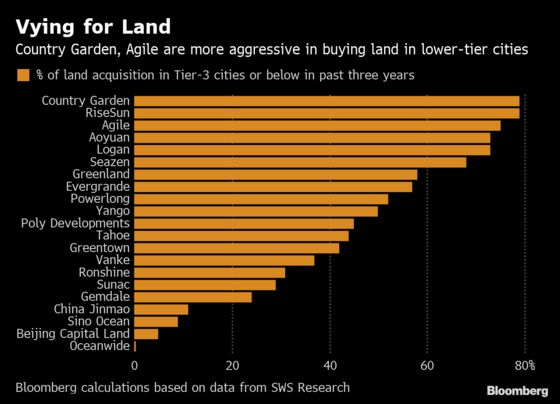 According to Bloomberg calculations based on SWS Research, developers such as Country Garden Holdings Co., RiseSun Real Estate Development Co., and Agile Group Holdings Ltd. have mostly bought their land in lower-tier cities in the past three years. Country Garden’s greenback bonds have risen 1.4 cents on the dollar since last Monday when the overall high-yield notes from China barely moved during the period. Country Garden is an “obvious beneficiary” as the developer has over 50 percent of its full year 2019 salable resources in lower-tiered cities. Future Land, CIFI and Logan will also benefit.